Are Sapphire Screens the Key to Hardened Mobile Devices for the Enterprise? Sapphire screens have made a big splash in the rumor mill lately for the next generation of iPhones. All the stories I’ve read tout sapphire’s scratch resistance, shatter-resistance, and even caustic substance resistance as great for consumers–but what about the enterprise? I will be giving a talk on enterprise iOS development for Windows Azure at the Modern Apps Live conference. This is held next month in Las Vegas. The whole conference is about using Azure as a back end for apps written for iOS, Android, WinPhone8, Windows 8, and the Web (responsive design). Well, I finally finished the third installment of my blog post series “9 Steps to Enterprise Mobile Self-Actualization” on the Magenic.com web site. Do Enterprises Want a 13-inch iPad Pro? A new rumor from Digitimes, reported by 9to5Mac, corroborates previous rumors (from The Wall Street Journal and others) of a larger, 13-inch iPad Pro. While I agree with much of 9to5Mac’s analysis, I don’t agree with their comments about keeping the same form factor as the current iPad, nor do I agree with the rumor’s educational customer emphasis. iOS is Dead! Long Live iOS! The meaning of the phrase “The King is Dead! Long Live the King!” may be lost on many Americans, as we don’t have a monarchy. It’s an apparent contradiction, and seems baffling. It has its roots in France, where as soon as the king died, his son or heir would instantly be the new king. So the phrase really means “The Old King is Dead! Long Live the New King!”. It just doesn’t sound as catchy that way. In a similar manner, it’s clear that Apple is declaring that “iOS is Dead! Long Live iOS!”. Allow me to explain. 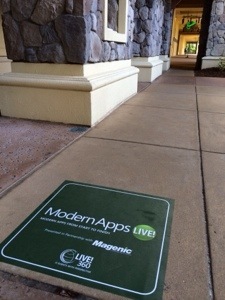 Join us at Modern Apps Live! in Orlando, Florida this week, where we discuss using a single Microsoft Azure back end to power iPad, Android, Windows Phone, and Windows 8 apps. I’ll be discussing how the iPad app was architected and coded, including third party libraries like AFNetworking and Azure Mobile Services.